Where do you start? The range and variety of motorcycle oriented equipment for adventure travel is vast and the choices seem endless. Reading other peoples opinions only heightens the sense of confusion. Research seems to take forever, prices vary considerably for what we perceive to be similar equipment and most of items we reviewed will do the job, but what is best for you and your circumstances? In deciding what to take a number of factors come into play, route or destination, budget, current equipment, previous experience and expertise, new or second hand options. All of these will shape your decisions as you plan your specific journey. We believe there are no right or wrong choices, just different ones that may or may not be tested depending on the circumstances you encounter en-route. We will be providing our comments and feedback on our choices as we travel as we use and test all the equipment under a variety of circumstances and conditions over the next 12 months, seeing if they stand up to the manufacturers’ and our expectations of their capabilities. We will keep you posted. Thanks to hearing someone’s comment in a forum somewhere, we decided that having the same bike could be extremely useful in case of electrical/mechanical failure, for diagnosis: one can take one part out of the working bike and replacing it into the broken bike until the broken part is identified. Also, in case of accident/illness or whatever, both of us could ride both bikes – Anne could not ride an extremely high seated bike for example. In determining our specific motorbike criteria we needed to take into account: no real mechanical motorcycle skills or experience, our age (over 50, closer to 60) and time limitations based on the insurance policy we took out for 12 months in October 2013. We have been fortunate in one sense that we were in a position to purchase mostly new equipment, but sadly this came about through my, Anthony’s, mother’s passing away late last year and leaving us enough to make this possible. I would like to think that she will be with us in spirit on the journey and will be pleased that we have chosen to use some her legacy in this positive way. Where did we start? Well, motorcycle boots purchased at the Birmingham International Motorcycle show in November 2013. We went to the show to be able to see all the bikes and compare models. At home we had a Triumph Street Triple, sadly written off in a no fault on my part accident in December 2012, and a Triumph Thunderbird Cruiser. Neither bike met our view of a RTW bike, enjoyable as each is in its own way. We have both found that for long distances, a more upright seated stance is more comfortable, something to do with the genetics, our parents, age, us and the passage of time. We also wanted a bike where Anne’s feet could be firmly on the ground. 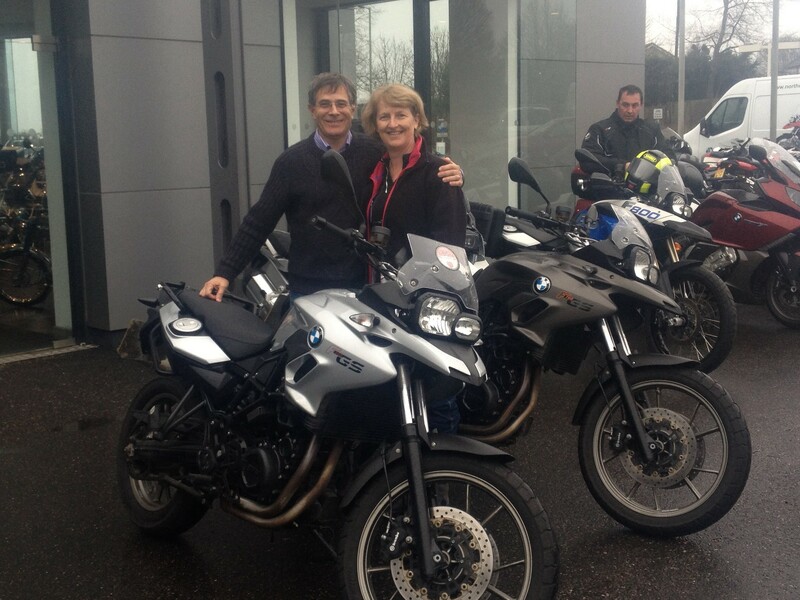 manufacturer and we had hired BMWs in Spain and Morocco so were familiar with the smaller GS models. Both Triumph and BMW helped arrange test rides with dealers who had the low seat options on the more off road orientated models. Our test rides narrowed the bike choice down to the BMW F700GS which offered us a bike we could both ride without lowering the suspension. The F700GS met this criteria but also had the most natural riding position. We then looked at the cost of new bikes, which along with the factory fitted options we may have been interested in soon pushed the price to over £10,000 per bike. This was too much. Anne then researched the dealers who were offering low milage 2013 demo bikes. We did not know at the time, but dealer demo bikes are usually fitted with all the options to show the customer. 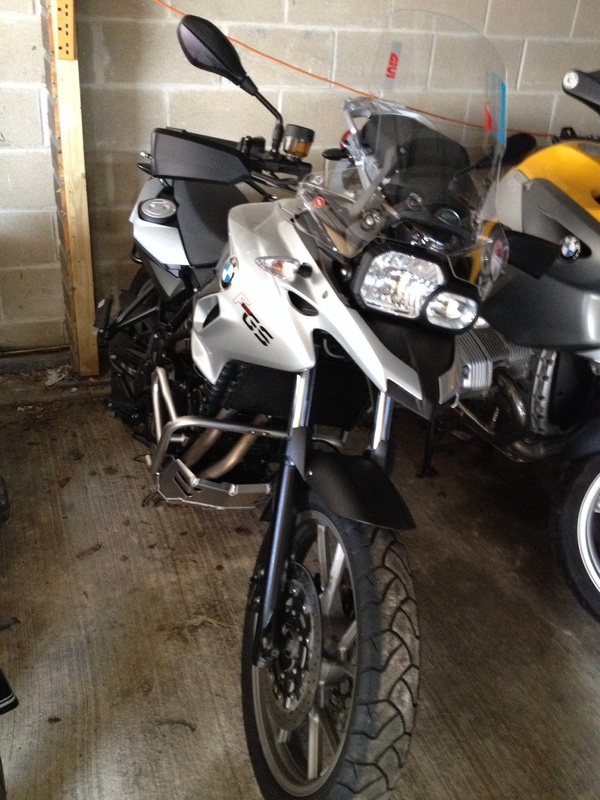 BMW Oxford had 2 BMW F700GS for sale and we then negotiated with them and reached a satisfactory deal. We had our bikes on the 30th January! replace the standard pannier mounts. We decided to get new jackets better suited to touring in hot countries. The main features we wanted included several vents, light in colour, practical pockets, waterproof (the practice of having to take a jacket off in the rain to insert a waterproof layer never made sense) and with good armour. 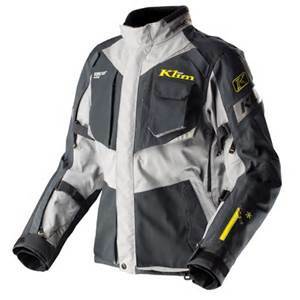 The Klim jackets ticked all the boxes,mand more. And Anthony’s Badland model also has chest armour. 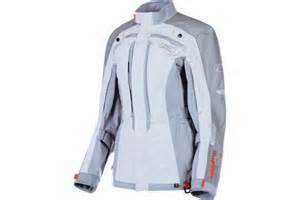 The armour Klim use is incredibly thin, yet more effective than thicker versions we’ve had previously and wonderfully supple making the wearing of these jackets very comfortable. Having ridden with those jackets for 14 months now, we are happy to report that we have been extremely happy with them. A few minor adjustments would make them even better – easier adjustable neck and a different adjustable cuff on the Lattitude jacket and turn the hip belt on the Badlands inside out so that tops do not fray from the velcro. After 3 years of good service from my KLIM Altitude jacket on our our two Round the World trips, but with a few niggling shortcomings, I looked forward to trying KLIM’s new Artemis range. I am happy to report I love it. All the shortcomings have been addressed: it has loads of pockets, more vents, better neck fastening and no more annoying velcro – thank you KLIM!! Nice to ride with ladies’ pants that fit too!! And see Camping Equipment page for non motorcycling specific equipment. SO exciting !! All equipment seems to be meeting your needs. Hi Antony and Anna, I’m Juan Carlos from Monterrey. How was your trip to Laredo? One question, can you give me the brand of your auxiliar lights?